Though allowing Saudi Arabia to stifle change and suffocate democratic aspirations within the region may appear to serve US interests in the short term, it will certainly have blowback down the road. At a watershed political moment, the United States has failed to act in accordance with its stated principles, and as a result, popular anger towards Saudi Arabia’s counter-revolutionary campaigns is causing increasing numbers of Arabs to turn against the United States as well. The fallout from Washington’s support for the Arab counter-revolution could haunt US policy for decades to come. The reaction of US elites to the wave of Arab democratisation has been lukewarm at best. While paying lip service to self-professed ideals of democracy and self-determination, government officials and policy analysts have expressed reservations about the long-term implications of Arab democracy to US strategic interests. Some US ruling-class pundits, like Daniel Pipes, the neoconservative director of the Middle East Forum, have worried about losing “our bastards” in the Middle East and the damage new regimes could do to themselves and their neighbours. Others have been busy wringing their hands about volatility in energy markets, reduced access to oil and natural gas reserves, and the potential nationalisation of corporate holdings. There is little doubt, however, that one of the main strategic concerns is the potential damage that a new power dynamic could inflict on the two key US regional allies: Israel and Saudi Arabia. Israeli fears have been apparent from the very beginning, which is not much of a surprise considering the anti-Zionist messages emanating from Egypt and Tunisia. Prime Minister Benjamin Netanyahu was visibly distraught over the loss of a key regional ally in Hosni Mubarak, and Israel's entreaties have likely contributed to the lukewarm US response to other uprisings. However, Israel was helpless in stemming the tides of change in Egypt, and initially watched with trepidation as the unfriendly but reliable regime of Bashar Al-Assad has teetered on the brink of collapse. Because of its limited regional reach, Israel has focused much of its energy on the halls of the US Congress, counting on the faithful support of like-minded US think tanks, journalists and pundits. The dirtier work of counter-revolutionary action, meanwhile, has fallen to the Saudi Arabian government. Nowhere has the outsized importance of Saudi interests been clearer than in the Obama administration’s response to the uprisings in the small island kingdom of Bahrain. Despite the apparently democratic, non-sectarian intentions of the protesters, both Riyadh and Washington were quick to play the sectarian card, inaccurately framing the conflict as one between Sunni and Shi’a, rather than between an entrenched regime and disillusioned citizenry. As a result, the United States has significantly stepped back its support for Arab revolutions. “Not only is the US—not to say the rest of the West—effectively deferring to Saudi policy, particularly in the Gulf, but it also appears to be hedging its bets against truly democratic change elsewhere in the region,” says Jim Lobe, Washington bureau chief of the Inter Press Service. By rebranding the protesters as Iran-affiliated sectarian zealots, the Saudi-dominated Gulf Cooperation Council (GCC) used a shared defence clause as a pretext to militarily assault the democratic movements. On March 14, its Peninsula Shield Force moved thousands of troops into Bahrain in response to a rapidly escalating protest movement. 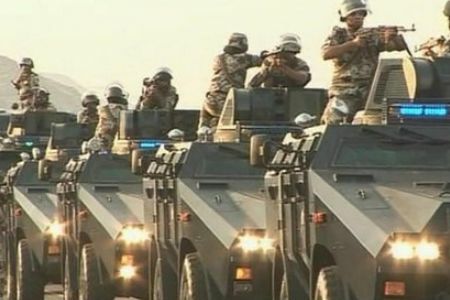 Despite assurances by Peninsula Shield force commander Mutlaq Bin Salem al-Azima that the military deployment intended to “bring goodness, peace and love to Bahrain”, video footage and eyewitness accounts detailed a grim scenario of mass arrests, beatings and dozens of deaths. Though the Arab world, along with much of the international community, was visibly outraged at the invasion, Washington remained hesitant to interfere. At a press conference held during some of the worst violence against protesters, President Obama refused to openly condemn the Saudi offensive, stating instead that “each country is different, each country has its own traditions; America can't dictate how they run their societies”. A week later, a spokesperson for chair of the Joint Chiefs of Staff, Admiral Mike Mullen, praised the Bahrain government “for the very measured way they have been handling the popular crisis here”. Many Washington insiders applauded the decision to defend the Bahraini monarchy, secure the US naval base and guarantee stability for the Saudi regime. Michael Rubin, a self-professed “Arab democracy expert” at the American Enterprise Institute, argued that Obama must “preserve the monarchies”, offering only enough reform to guarantee “renewed stability and preservation of regimes that are essential to US national security”. Regardless of whether Washington actively endorses Saudi Arabian objectives in Bahrain and elsewhere, there can be no doubt that US support for the monarchy has been a cornerstone of Washington’s regional foreign policy. US arms exports to Saudi Arabia have recently surpassed the level of weapons supplied to Israel, making Saudi Arabia the number one importer of US weapons worldwide. Meanwhile, the GCC has begun to expand its reach to include other conservative Arab monarchies, entertaining the possibility of adding Jordan and Morocco to its membership list. Though Jordan and Morocco have historic ties with the Gulf, primarily through energy dependence and economic aid, the inclusion of non-Gulf states into the GCC is an unprecedented maneuvre, leading the Economist to joke that the organisation should be renamed the “Gulf Counter-Revolutionary Club”. Remarkably, scarcely a word of protest has emanated from Washington. Elliott Abrams, a neoconservative ideologue at the ruling-class think tank Council on Foreign Relations, admitted that “the Saudis have counseled (i.e., pressured) the kings of Morocco and Jordan to abandon their announced reform plans”, while arguing that “an enlarged and well financed GCC can provide real leadership to the Arab world”, stressing the need to “preserve royal roles” and “good relations with the United States, including in most cases close intelligence and military ties”. The influence and power of the GCC can also be seen in Yemen, where the Saudis have assumed primary responsibility for mediating between the Yemen public and their delegitimised dictator, Ali Abdullah Saleh. The GCC plan—calling for immunity from prosecution for Saleh and a guaranteed majority for Saleh’s party in the future cabinet—was roundly rejected by the public, eliciting demonstrations and riots across Yemen. Once again, Washington turned a blind eye to popular demands, deferring to the GCC plan and moderating its own expectations to align with those of the Saudis. Rep. Ileana Ros-Lehtinen (R-FL) used the same rhetoric employed by beleaguered dictators across the Middle East to warn a US House of Representatives Foreign Affairs Committee hearing that Yemen constitutes a “jihadist nest” where the loss of strong leadership would inevitably embolden terrorist movements. The Obama administration followed suit, strongly urging both the Yemen government and the protesters to accept Saudi mediation. Even now, Saudi Arabia has continued to support Saleh during his convalescence in Riyadh, helping to plan and support his return to Yemen. Despite the fact that Yemeni opposition groups have formed their own transitional council, both Saudi Arabia and the United States have continued to insist on Saleh’s return, and many expect Yemen to descend back into chaos as a result. Even the successful overthrows in Tunisia and Egypt are being directly influenced by Saudi Arabia. While Ben Ali lives comfortably in exile in Jeddah, Saudi Arabia has stepped up as the largest creditor for both Tunisia and Egypt, providing US$4 billion to Egypt alone in the form of soft loans, credit lines, bond purchases and central bank deposits, more than double the amount pledged by the United States. Such financial reliance will doubtless buy significant political influence, and high-level Egyptian government officials have already met on numerous occasions with members of the ruling Al-Saud family. Concerns already abound that Saudi influence is negatively affecting the trial of Mubarak. After Saudi officials condemned Mubarak’s prosecution as a “humiliating spectacle”, the trial has subsequently been pulled from television, and adjourned until the following month. “Pro-Israel” US organisations such as the Washington Institute for Near East Policy are conveniently ignoring the pervasive Saudi influence on the post-revolutionary states. A recent report by David Schenker titled “Egypt’s Enduring Challenges: Shaping the Post-Mubarak Environment” devotes significant attention to “concerns about Iran” and the importance of “Standing up to Hizballah”, but any discussion on Saudi Arabia is notably absent. For its own part, Washington has hedged its support for the burgeoning democracy in Egypt by channelling much if its funding directly to the military, and exerting influence to ensure that trusted military leaders maintain significant political power. Such figures, such as commander-in-chief Mohamed Tantawi, have been largely discredited by the Egyptians themselves, and many have troublesome histories as puppets of the dictatorship. Their presence may keep the situation temporarily stable, but the long-term effects of externally supporting Mubarak’s legacy will almost certainly prove troublesome. With Libya now under the control of rebel forces, it is useful to see the role that GCC money, arms, intelligence and strategic support have played in propping up the Libyan Transitional National Council (TNC). Keen to keep the anti-Gaddafi movement controlled by Gulf-friendly allies, the Saudis have actively worked to bestow legitimacy to factions led by ex-justice minister Mustapha Abdul-Jalil, and Saudi training and support has encouraged the creation of a surprisingly robust security apparatus for the state-to-be, complete with torture, indefinite detention and acts of wanton violence again civilian populations. The preservation of the Arab monarchies is a clear strategic benefit to Saudi Arabia, and the monarchs’ willingness to support militarist US policies has earned them the support of the US. History, however, cannot be unmade, and the rising tide of resentment Arabs bear for their rulers is quickly translating into frustration toward the Western powers that enable them. Much as the US-sponsored overthrow of Iran's Prime Minster Mohammed Mossadeq has coloured Iranian relations with the United States for decades, so will its handling of the Arab Spring determine how the next generation of Arabs will choose to interact with the United States. Preliminary polling by the Pew Research Center shows that Egyptians’ approval rating of the United States remains below 20 per cent, and most Egyptians view Washington as an obstacle to their liberation, rather than an advocate for it. A recent poll conducted by IBOPE/Zogby International that shows in post-revolutionary Egypt support for the United States is at an all-time low of 5 per cent. Similar trends are seen in in the newly inducted GCC states of Jordan and Morocco. To continue to ignore the democratic aspirations of millions, in the interests of misguided short-term strategies, is to doom US efforts in the Middle East for decades to come. Undoing the damage caused by the “US-Saudi Axis” will require US policymakers to break with the Saudi regime, denounce its efforts to stifle democracy, and roundly criticise its draconian subjugation of its own population. Otherwise, Washington’s legitimacy can scarcely be said to be any higher than that of the regimes it continues to support. Daniel Pipes, “Reflections on Hosni Mubarak’s Resignation”, DanielPipes.org, February 11, 2011, http://www.danielpipes.org/blog/2011/02/reflections-on-hosni-mubarak-resignation. James Smith, “US Ambassador on Oil Supplies, Arab Spring,” Susris Tube, March 11, 2011, http://susristube.com/2011/03/11/us-ambassador-on-oil-supplies-arab-spring/. Joseph Massad, “The Future of the Arab Uprisings,” Al Jazeera, May 18, 2011, http://aljazeera.com/indepth/opinion/2011/05/201151885013738898.html. “Egyptian protesters hold an anti-Israeli sign while waving Egyptian and Palestinian flags in the coastal city of Alexandria,” Oman Daily Observer, May 14, 2011, http://main.omanobserver.om/node/50989. Barak Ravid, “Netanyahu warns outcome of Egypt revolution could be like Iran's,” Haaretz, January 31, 2011, http://www.haaretz.com/news/diplomacy-defense/netanyahu-warns-outcome-of-egypt-revolution-could-be-like-iran-s-1.340411. Edmund Sanders, “Israel fears the alternative if Syria's Assad falls,” Los Angeles Times, March 30, 2011, http://articles.latimes.com/2011/mar/30/world/la-fg-israel-syria-20110331. [7i]David Byrd, “Bahraini Source Contradicts Government Version of Crackdown,” Voice of America, May 26, 2011, http://www.voanews.com/english/news/middle-east/Bahraini-Source-Contradicts-Government-Version-of-Crackdown-122662524.html. Thomas Erdbrink and Joby Warrick, “Bahrain crackdown fueling tensions between Iran, Saudi Arabia,” Washington Post, April 22, http://www.washingtonpost.com/world/bahrain-crackdown-fueling-tensions-between-iran-saudi-arabia/2011/04/21/AFVe6WPE_story.html. Muqbil al-Saeri, “A talk with Peninsula Shield force commander Mutlaq Bin Salem al-Azima,” Asharq AlAwsat, March 28, 2011,http://www.webcitation.org/5xYJcDTUV. Barack Obama, “Press Conference by the President,” February 15, 2011, http://www.whitehouse.gov/the-press-office/2011/02/15/press-conference-president. Stephen Zunes, “America Blows It on Bahrain,” Foreign Policy in Focus, March 2, 2011, http://www.fpif.org/articles/america_blows_it_on_bahrain. Michael Rubin, “What To Do about Bahrain,” American Enterprise Institute, February 18, 2011, http://www.aei.org/article/103193. “Saudis Replace Israel as Top Importer of US Arms,” World Tribune, July 7, 2011, http://www.worldtribune.com/worldtribune/WTARC/2011/ss_military0837_07_07.asp. “The Gulf Co-operation Council: A club fit for kings,” The Economist, May 19, 2011, http://www.economist.com/node/18713680?story_id=18713680. Issandr El Amrani, “Some thoughts on GCC enlargement,” The Arabist, May 14, 2011, http://www.arabist.net/blog/2011/5/14/some-thoughts-on-gcc-enlargement.html. Elliot Abrams, “The GCC: “Carefully Considered Reform” or Reactionary Politics?,” Council on Foreign Relations, May 12, 2011, http://blogs.cfr.org/abrams/2011/05/12/the-gcc-carefully-considered-reform-or-reactionary-politics/#more-1039. Christine Theodorou and Hakim Almasmari, “Witnesses: Thousands protest deal granting Yemeni president immunity,” CNN, April 24, 2011, http://www.cnn.com/2011/WORLD/meast/04/24/yemen.president.exit/index.html?hpt=T1. Howard LaFranchi,“Why Obama isn't pushing for Yemen president to go: Al Qaeda,” Christian Science Monitor, March 22, 2011, http://www.csmonitor.com/USA/Foreign-Policy/2011/0322/Why-Obama-isn-t-pushing-for-Yemen-president-to-go-Al-Qaeda. Ileana Ros-Lehtinen, “Ros-Lehtinen Opening Statement from Yemen Hearing,” Council on Foreign Affairs, February 3, 2010, http://foreignaffairs.house.gov/press_display.asp?id=1250. Associated Press, “US envoy in Yemen to push for power transfer”, CBS News World, July 11, 2011, http://www.cbsnews.com/stories/2011/07/11/ap/world/main20078495.shtml. Kasinof, Laura, “Yemeni Opposition Leaders Form National Council,” The New York Times, August 17, 2011, http://www.nytimes.com/2011/08/18/world/middleeast/18yemen.html. Una Galani, “Saudi $4 bln lifeline to Egypt won’t come for free,” Reuters, May 23, 2011, http://blogs.reuters.com/columns/2011/05/23/saudi-4-bln-lifeline-to-egypt-wont-come-for-free/. News Africa, “Saudi Arabia official says Mubarak’s trial is a humiliating spectacle for everyone,” Newstime Africa, August 4, 2011, http://www.newstimeafrica.com/archives/21788. David Schenker, “Egypt’s Enduring Challenges: Shaping the Post-Mubarak Environment,” Washington Institute for Near East Policy, April, 2011, http://www.washingtoninstitute.org/pubPDFs/PolicyFocus110.pdf. Jim Lobe, “Arab Spring Stalls as US Defers to Saudi ‘Counter-revolution’,” Inter Press Service, April 23, 2011, http://ipsnews.net/news.asp?idnews=55365. Chick, Kristen, “Egypt's Army, once the darling of protesters, is now the subject of criticism,” Christian Science Monitor, April 8, 2011, http://www.csmonitor.com/World/Middle-East/2011/0408/Egypt-s-Army-once-the-darling-of-protesters-is-now-the-subject-of-criticism. David Zucchino, “Libyan rebels appear to take leaf from Kadafi's playbook,” Los Angeles Times, March 24, 2011, http://www.latimes.com/news/nationworld/world/la-fg-libya-prisoners-20110324,0,5389027,full.story. Cockburn, Patrick, “Libya's ragtag rebels are dubious allies,” The Independent, August 11, 2011, http://www.independent.co.uk/opinion/commentators/patrick-cockburn-libyas-ragtag-rebels-are-dubious-allies-2335453.html. Kareem Fahim, “Libya Revolt Sidelines Women, Who Led It,” New York Times, May 19, 2011, http://www.nytimes.com/2011/05/20/world/africa/20benghazi.html. As’ad Abu-Khalil, “GCC leads the Yemen...REVOLUTION?” Angry Arab News Service, April 11, 2011, http://angryarab.blogspot.com/2011/04/gcc-leads-yemenrevolution.html. “Egyptians Embrace Revolt Leaders, Religious Parties and Military, As Well,” Pew Research Center Publications, April 25, 2011, http://pewresearch.org/pubs/1971/egypt-poll-democracy-elections-islam-military-muslim-brotherhood-April-6-movement-israel-obama.